In the business world, it can be tough to find that perfect balance and achieve optimum productivity. The day often turns out much differently than it was planned over morning coffee. Stress is a fact of life for professionals. But there are many ways you can cope so it doesn't take over your day-to-day performance or well-being. Business leaders from all backgrounds are looking for outside-the-box strategies to reduce stress and make the most out of each hour. Here are some approaches to consider implementing so you and your team fire on all cylinders -- minus the afterburn. No matter how many employees you have, commit yourself to being upfront about everything from small goals to the company's overarching vision. Transparency has proven vital to employee happiness. Maintaining authentic transparency isn't quite as easy as it sounds. This practice starts at the top. Be sure that upper management on down encourages open communication. A central virtue of transparency: Everyone feels free to speak his or her mind. Make it clear to all who work in your operation that honest feedback is crucial to the company's growth and development. Embrace transparency, and you'll soon learn it doesn't just help workers discover their full potential, it helps build trust and credibility across the board. Superior organizational skills set successful professionals apart from the rest. It's incredibly easy to get overwhelmed when you fail to create and maintain an organizational system that works for you. Before you can collect yourself, tasks can slip through the cracks. Instill a firm strategy for organization throughout your entire company to help ensure high productivity and a focus on important objectives. You don't have to reinvent the wheel, either. Project-management software and team-collaboration programs can assist as you work to keep your entire team on the same page in terms of workload and prioritization. Tools such as WorkZone allow you to create in-depth to-do lists, ease individual workload and promote open communication across a wide variety of tasks. What is one of the main reasons why people buy pets? The unique human-animal relationship helps make life more enjoyable. Many college campuses now dedicate rooms to pet-therapy programs. This helps students deal with stress throughout the semester and particularly during finals time. Welcoming pets into the workplace could do the same for your employees. At the same time, it would eliminate the need to leave pets alone at home all day and give your team members a good excuse to get up, walk around and interact. 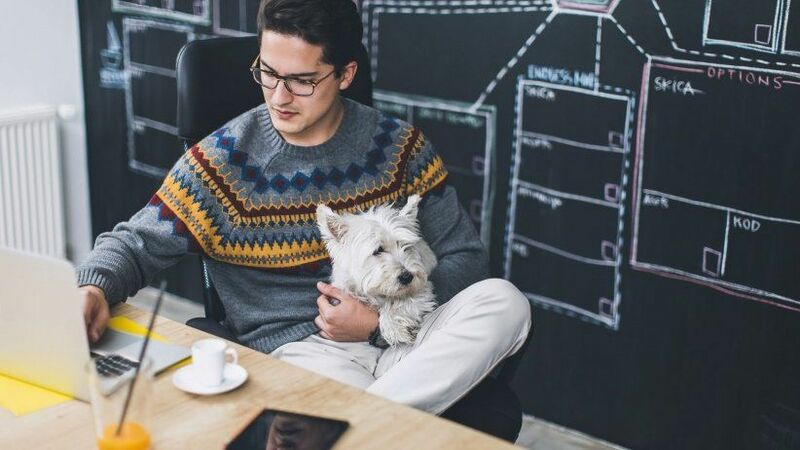 A study conducted by Virginia Commonwealth University found that people who brought their pets to work had lower stress levels throughout the workday than those who left pets elsewhere -- or simply didn't own a pet. In most cases, dogs are the furry workplace companion of choice. Work becomes a second home (and family) to them. Depending on how far you commute, you and your four-legged friend will benefit from keeping tabs on pet-service providers near your workplace. If you already have a dog or are planning to own one, you know it adds an extra layer of responsibility in your life. Those who consider their dogs to be a child-like part of the family will appreciate the convenience of dog-parenting apps such as Barkily. This tool allows you to store important medical/health information and access all your dog-related details. Barkily also helps locate dog-friendly parks, restaurants, bars and caretakers in the area. It makes your office home-away-from-home much easier to navigate for you and your best friend. The thought of being cooped up for hours and hours every day can seem like a death sentence for some people. Before email and the internet, submitting to 40 hours a week within the same four walls was the norm. Modern workers can be productive nearly anywhere their bandwidth connection can find a steady signal. For this reason, many companies are offering flexible work arrangements, including remote teams. More than 90 percent of workers who responded to a recent TinyPulse survey claimed to be more productive when working from home. In addition, giving employees the ability to work outside the office allows more time with family and less fear they'll miss out on life's precious moments. Managers often cite lack of communication as a primary argument against remote work. But tools such as Slack and HipChat make it simple to stay in constant contact with employees or give them more freedom, as appropriate to the individual and the project at hand. However, you can implement a number of strategies to help people disconnect when needed. For starters, try encouraging everyone to use a time-blocking model. You and your team members might set aside certain times strictly for checking to-do lists, answering emails, catching up on industry news or some other agreed-upon task. Once a productive flow develops, budget time for checking social-media updates as its own (smaller) time block. Here's another approach: Use AntiSocial or another app to track exactly how much time is spent on social media. This same tool can -- at the user's request -- block those time-wasting sites to remove the temptation. Interruptions can be extremely costly. Many people are addicted to social media in some form or another. The inability to control it can spell death for productively. The work environment you create has an effect on your general outlook and affects everyone engaged in your mission. Company cultures are changing, in part because millennials are rewriting the rule book as they flood the marketplace. But keep in mind that nothing should be written in stone. As your company evolves, assess the strategies in play and adapt them to change how your business helps everyone manage stress and boost productivity.